Audience primary school age – Grade 1-3. ‘Billy Cart Derby’ is predominately an early reader text, the words are large, black and white pictures accompany most pages and there are only 29 pages. 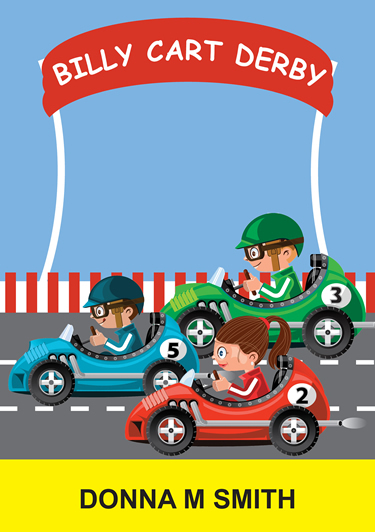 The story line covers a Billy cart race at Happy Valley Primary School between Grade two and Grade three and the children are excited! TJ, Ben and Jaz interact and it shows through the dialogue their excitement building. The dialogue is easy and believable and the lead up to the derby mentions the nerves children feel, which most children can relate too along with the anticipation, the race itself and the glory in victory. I love the addition at the end of the book for teachers with suggestions on classroom discussion and activities they can do. As a home reader and school resource Billy Cart Derby is a winner and boys especially will relate to this great story.